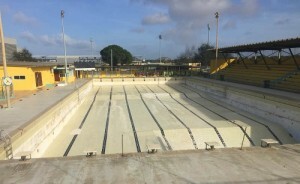 WILLEMSTAD - The pool at the Sports Center Curaçao (SDK) in Brievengat is open again. Some schools already used it this week for their swimming lessons. The pool was closed since November 2015 because the Health Department discovered bacteria in the water. When all the water was drained, the workers discovered that the tiles were in bad shape. The total cost of repair was about 1.5 million guilders. The 40 schools that use the pool for their mandatory swimming lessons can finally use it again. This will ease the load on the Benny Leito pool in Otrabanda.